We would not be returning to North Concord Elementary. Instead, we had been transferred to East Concord Elementary, a completely different school in a totally different village. The Rainey girls from Gallup Mills had also been transferred; so this was probably a decision that had been made for the whole township and not particularly Mom's idea. Mrs. Carpenter was still our school bus driver and her VW microbus was still our school bus. This year little Louise would be attending first grade; Mary Joan was in second, and I was in third. Between the three of us and the four Rainey girls, the VW was pretty full; however, we did pick up a couple more kids on our way past North Concord, a fifth or sixth grader named Richard Beck and a fourth grader named Charlene Noble. Charlene's family were the only other Catholics in Victory and we sometimes saw them at Mass; that fall, Father Mike began holding monthly catechism classes in her house. 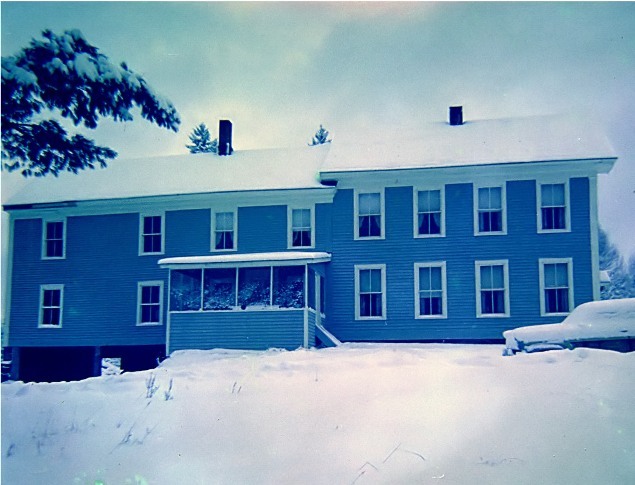 Ours was a three-room schoolhouse. My sisters were both in Mrs. Casey's classroom, which held first, second, and about half of the third grade. Mrs. Howe taught the middle classroom, with the remainder of third grade, and fourth and fifth grades. Sixth, seventh and eighth grades occupied the third classroom. I was placed in Mrs. Howe's classroom, presumably to avoid having more of the same family in one room than could be helped. I loved Mrs. Howe. She was no-nonsense but gentle. Kids in the class obeyed her because they wanted to, not because they were afraid not to. I didn't like arithmetic any better in third grade than I do now, and would find any excuse to not do my homework. Finally, Mrs. Howe set up an "account" of back homework for me. I must have been a month behind when she first did this. As long as I had all the assignments completed by report card time, I would get grades for them. If not, I would fail and probably be put into Mrs. Casey's room. I did the homework, and discovered the sense of satisfaction one gets from completing even an unpleasant assignment. Mrs. Howe read books to us. I remember Understood Betsy, and a Danny Dunn story, and Wind In The Willows. Mom had never read to me, though she made up stories when I was little. But Mrs. Howe definitely gets credit for sparking my love of books. She also encouraged my love of writing. She offered me "extra credit" for writing stories on my own and turning them in, upon which she would make light spelling corrections but mostly, I realize now, simply encourage my creativity by giving me an audience. I mostly wrote stories about Jor-El, Superman's father, when he was a little boy on Krypton. Mrs. Howe often urged me to write about "what you know" but she never discouraged me from writing fantasy. Knowing I was interested in science, Mrs. Howe was sure to keep me informed any time she heard of a new discovery or published theory. The possibility of life on other planets was a topic she seemed to find as exciting as I did. 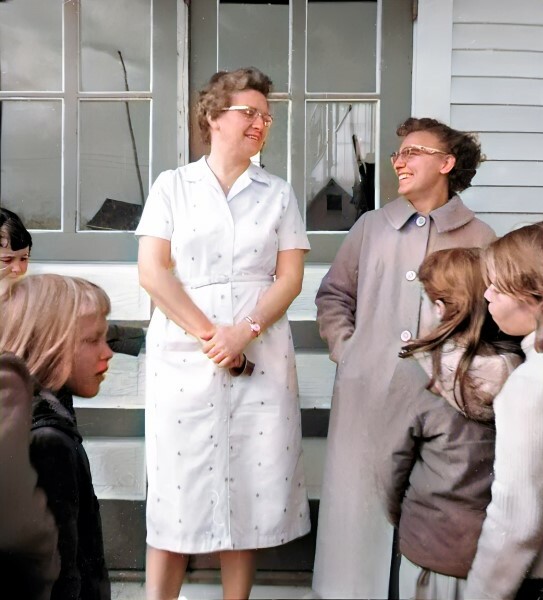 In the early fall when it was still warm, Mrs. Howe sometimes led us out to a rocky meadow behind the school where we could eat our lunches in the fresh air and sunshine. A merry little creek ran through the field, and sometimes we'd take our shoes and socks off and get our feet wet, then stretch out on a rock and let them dry before return to class. And in the winter, where it was necessary to run the outside water tap to prevent freezing, a hose directed the water to pour down a jagged rocky path at the side of the schoolhouse. The water froze solid, creating a steep and fun ice slide. We'd sit on a sheet of cardboard and slide down to the bottom of the hill during recess, returning to class with noses running, cheeks red and eyes bright. I began developing a bad case of what my mom called "schoolbus-itis", because I would claim to be "sick" in the morning yet recover miraculously once Mrs. Carpenter had come and gone. But it was always because I was very tired in the morning; not ever because I didn't want to be in school. In mid-October, the first snow fell. Our house grew bitterly cold despite the renovations. And the road outside was still unpaved, and would soon be impassible for all practical purposes. Mom decided to winter at Val's Motel in Concord. She packed our winter clothes in suitcases, made sure all the doors and windows were locked, and piled my sisters and me and Wrags into the Country Squire. We weren't changing schools. We were only moving fifteen miles or so down the road. But that road would be paved, and electric lights would flick on instantly instead of waiting a few seconds, and there would be endless hot water for baths. It would be a different world.